Nagasaki has the unenviable place in history of being the second city subjected to the horror of an atomic bombing, which took place at 11.02am on August 9, 1945. Over 150,000 people were killed or injured and approximately one-third of the city was flattened by the ferocity of the windblast and scorching heat generated by the explosion. Today, Nagasaki along with Hiroshima stands as a reminder of an event that must never happen again and of the resilience of both nature and the human spirit. Whilst forever scarred, the city has grown from the ashes and regenerated itself. As with Hiroshima, the city has sought to use the past to promote the message of peace to the rest of the world and in this post I want to highlight some of the symbols for peace to be found in Nagasaki. 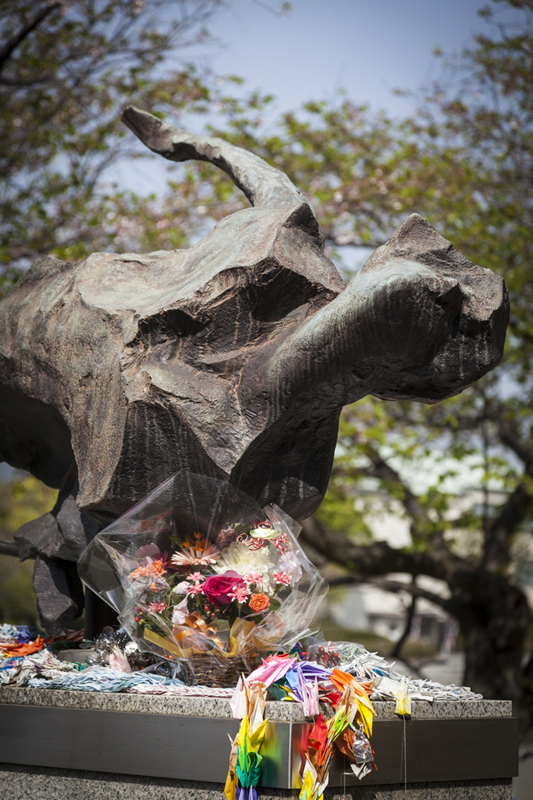 The opening photograph is a view looking out over the city from the Nagasaki Peace Park and within the park one finds a number of impressive sculptures promoting the need for peace, of which the most dominant is Seibo Kitamura’s Peace Statue at the northern end of the park. Who could walk away without praying for peace? This statue was created as a signpost in the struggle for global harmony. the beauty of health and virility. and the face prays deeply for the victims of war. and the highest hope of all mankind. At the southern end of the park is the Fountain of Peace, constructed in 1969 as a prayer for the souls of atomic bomb victims who perished searching for water. 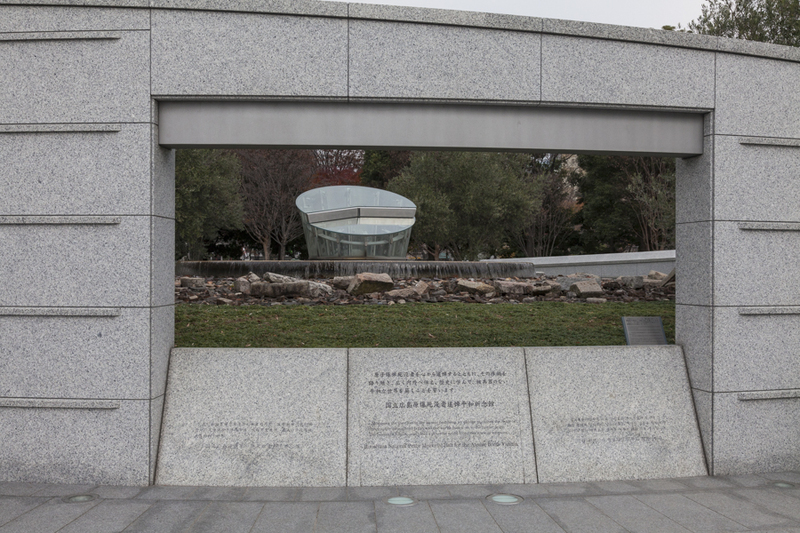 A stone plaque in front of the fountain carries the following words from a poem written by a survivor – a young girl named Sachiko Yamaguchi who was nine years old at the time of the blast. Nagasaki has historically had a significant Christian population and a tragedy within a tragedy occurred when the Urakami Cathedral, only 500 metres from the epicentre of the blast, was destroyed whilst a Mass was being held. The congregation attending Mass was cindered and buried, with the loss of life and property presenting a spiritual challenge to the religious community. Similar to the debate around the future of Hiroshima’s Dome building, there was a difference of opinion as to whether or not to rebuild the cathedral. In this instance, the congregation was successful in its desire to rebuild, despite the city government’s preference to preserve the site as a memorial. Rebuilding commenced in 1959, with further remodelling in 1980 to more closely align with the original French style. Today the Cathedral holds a dominant position in the Nagasaki streetscape, as can be seen below at pics 7 to 10. Some scars from the bombing have been retained such as a fallen belfry being left where it fell (pic 9) and battered statues (pic 10) near the front of the Cathedral. On the walk from the Peace Park to the Cathedral I came across a small museum commemorating the life of Dr. Nagai Takashi. Dr. Takashi was a radiologist who, prior to the bombing, had been diagnosed with myeloid leukaemia as a consequence of working with sub-standard equipment and given three years to live. As well as losing his wife in the bombing, he was further injured, yet continued to work tirelessly to help victims and write extensively on the subject of radiation treatment. 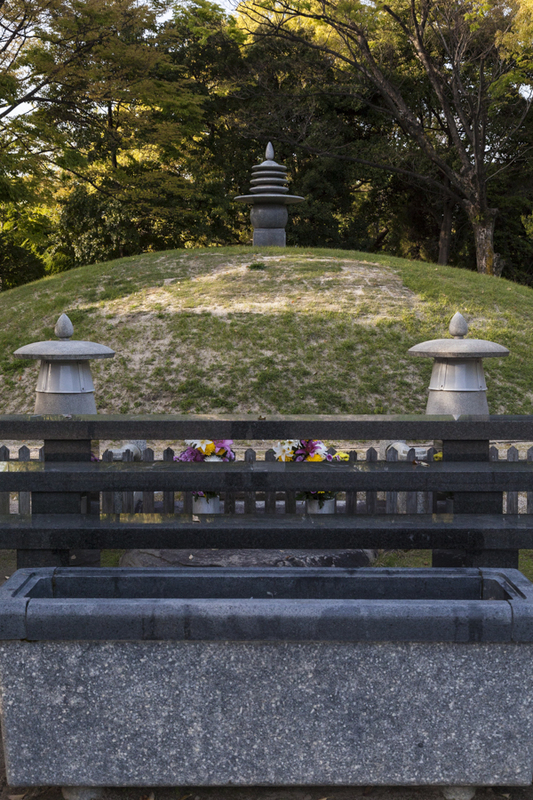 Until his death in 1951 (aged 43), Dr. Takashi lived with his two children in Nyokodo (As Thyself Hermitage), which stands today as a symbol of Dr. Takashi’s selflessness and community spirit (refer pics 11 and 12). A display (pic 13) from the Atomic Bomb Memorial Hall serves as a sobering reminder of the destructive nuclear arsenals that represent an ever-present danger to the ideal of peace in our times. When faced with such reality, the lessons that can be learnt from Nagasaki and Hiroshima take on an even greater importance and monuments such as People at Peace (pic 14) found in both Nagasaki and Hiroshima serve as apt reminders of what should be. Tags: atomic bomb, Belfry*, Black Border Images, Cloak of Peace*, Dr. Nagai Takashi*, Fountain of Peace*, Japan, John Liddle, johnliddlephotography, Maiden of Peace*, Monuments*, Nagasaki, Nagasaki Peace Park*, Nyokodo*, Peace Statue*, statue*, Travel, Urakami Cathedral* | Permalink. I had expected to be posting on a different subject, but changed my mind when I learned that the Nobel Peace Prize 2017 was awarded to International Campaign to Abolish Nuclear Weapons (ICAN) “for its work to draw attention to the catastrophic humanitarian consequences of any use of nuclear weapons and for its ground-breaking efforts to achieve a treaty-based prohibition of such weapons”. Technology has taken great leaps forward since 1945 and the destructive power of today’s nuclear warheads is many times greater than the weapons used in 1945. When considered alongside the current emergence of leaders apparently more driven by ego than wisdom, ICAN’s work is timely. The photographs I have chosen are a combination of historic photographs and photographs of paintings made by survivors almost 60 years later of their memories from 6 August 1945. The clarity of those memories reflected through their art talks directly to the impact on their lives. I have also included links below to a series of posts I made on Hiroshima in August 2014. Thank you for reading and I hope you will consider your position on this important issue. Tags: atomic bomb, Black Border Images, Buildings, destruction, Dome Building, Hiroshima, historic sites, ICAN, International Campaign to Abolish Nuclear Weapons, Japan, John Liddle, johnliddlephotography, Nobel Peace Prize 2017, nuclear, President Obama, ruins, survivors' drawings* | Permalink. This is the fourth and final post of my Hiroshima series. I realise that the subject matter has often been confronting, but I believe we must sometimes confront the horrors of the past to focus on a brighter future. I am happy to end the series with a selection of photographs taken during a visit to Hiroshima’s Shukkeien Gardens. One may view the photographs as “pretty pictures” and that is essentially what they are. However, I ask that viewers consider the following facts about the Shukkeien Gardens. First opened to the public in 1940. Demolished by the A-bomb on August 6, 1945. Approximately 1.4 kilometres from the bomb’s hypocentre. Victims took refuge in the gardens. Most died and their remains are interred there. 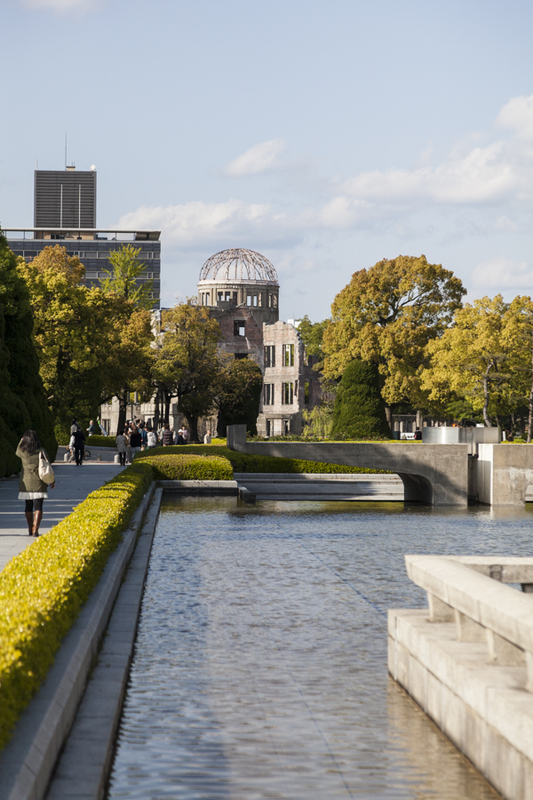 When viewed in this light, I see the gardens as a symbol of regeneration and a place that has once again become a happy place for residents of and visitors to Hiroshima. Even the high-rise buildings that overlook and somewhat diminish the ambience of the gardens can be viewed as a sign of a city moving forward. To those who have viewed this series – thank you! Tags: atomic bomb, Black Border Images, Hiroshima, Japan, John Liddle, johnliddlephotography, Shukkeien Gardens, Travel | Permalink. Take away the Dome Building from the background of pic 1 and the scene could resemble that found in many municipal parks around the world. 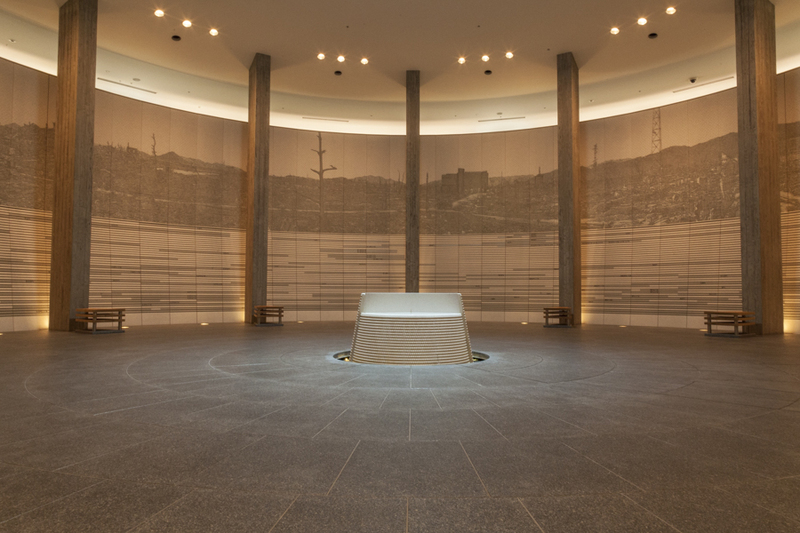 However, Hiroshima’s Peace Park is no ordinary park, of which the Dome Building is the focal point and one of many memorials within the Peace Park. 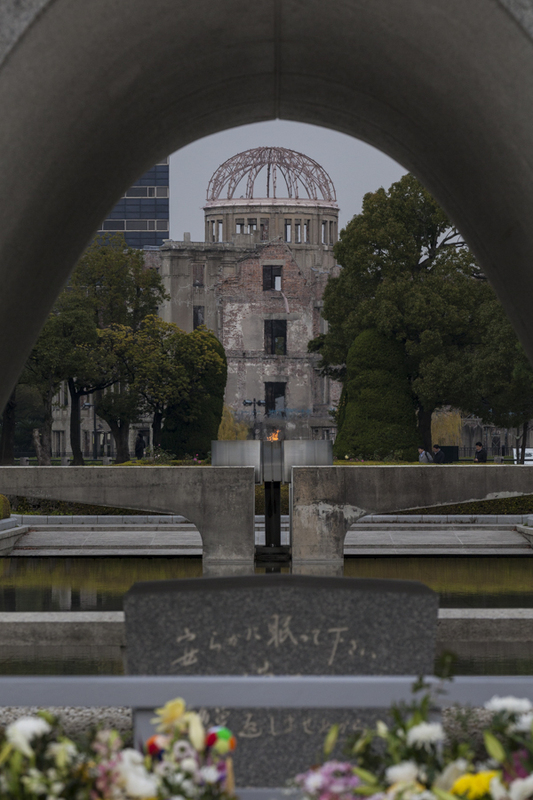 Four years to the day after the bomb was dropped, the decision was taken to devote the area to peace memorial facilities – a major change from the area’s previous role as Hiroshima’s political and commercial centre. Construction of the park took place between 1950 to 1964 and for those interested in early footage of this period, I again refer you to the classic French movie titled “Hiroshima Mon Amour”. This post shares images of some memorials and their significance, though I must qualify this by saying that their significance is most strongly felt on site. The Cenotaph for the A-Bomb Victims (pics 2 and 3) straddles a direct line of sight between the Dome Building and the Peace Museum. 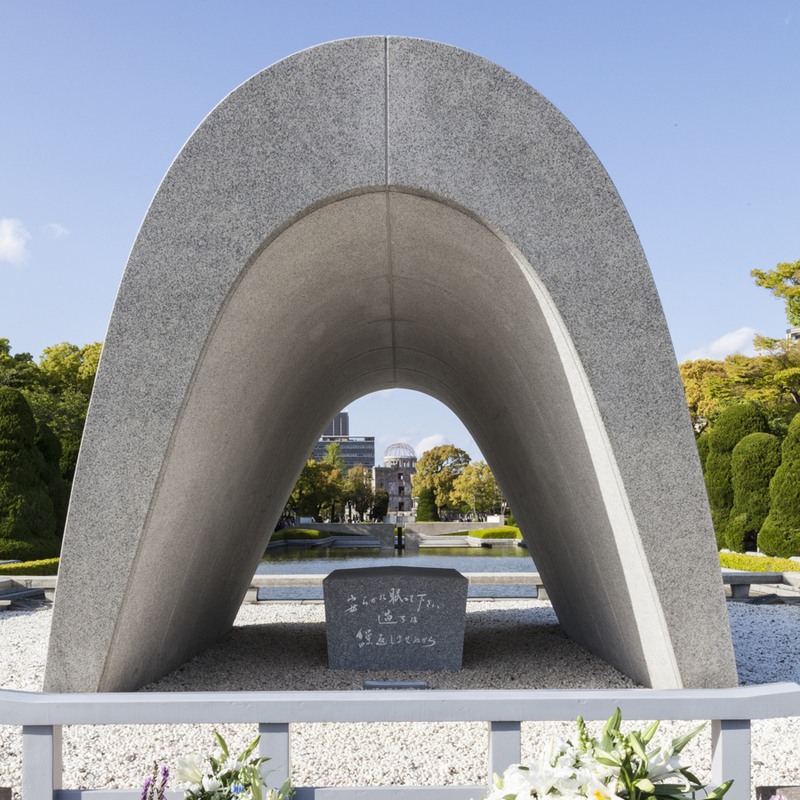 Below the arched tomb is a stone chest with a register of the names (more than 200,000) of those who perished in the initial blast or through subsequent exposure to radiation. At the centre of pic 3, one can see the Peace Flame, which has burned continuously since it was first lit in 1964. The Flame stands as a perpetual beacon for peace and will only be extinguished when all nuclear weapons are destroyed. Sadly, one must wonder if that will ever happen. 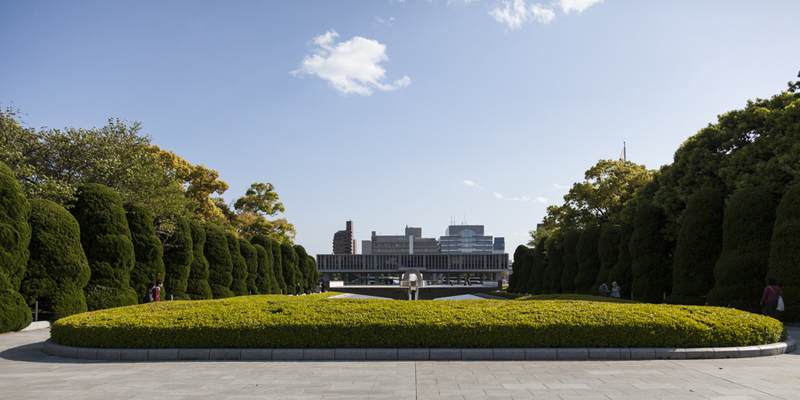 To the east of the Cenotaph lies the Hiroshima National Peace Memorial Hall, a beautiful yet sobering remembrance to the atomic bomb victims. On the roof of the mostly underground memorial (pic 4), one will observe the clock frozen at 8.15am to mark the time the bomb exploded and the cascading water, symbolic of survivors’ craving to quench their thirst. Below ground the central feature is the Hall of Remembrance (pics 5 and 6), which features a 360-degree panorama of the destruction following the blast. 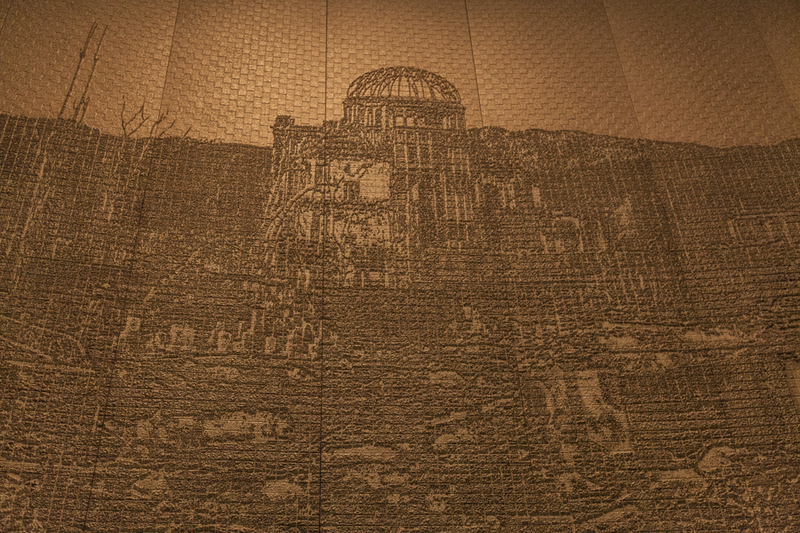 To create the panorama, a total of 140,000 tiles were used to represent the estimated number of people who died from the bomb by the end of 1945. The depiction of individual victims through their photos on a bank of frequently refreshing screens (pic 7) communicates the personal cost of the tragedy and serves to remind us how many families must have been impacted directly or indirectly. The statue atop the monument shows a girl with outstretched arms, above which is the representation of a folded paper crane. This depiction was inspired by the true story of Sadako Sasaki, a young girl who had appeared to survive the blast only to succumb to a radiation related illness some years later. Sadako’s belief that by folding 1000 paper cranes she would be saved was sadly not enough to save her. 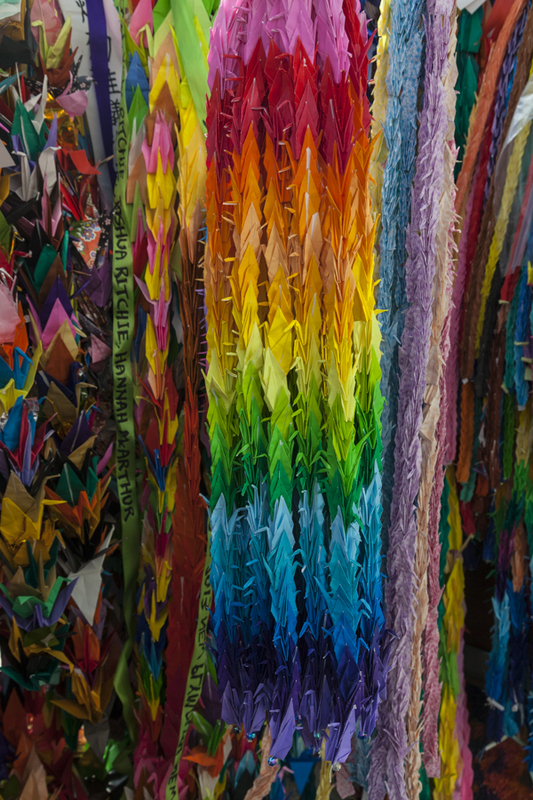 However, her story lives on through the adoption of paper cranes (pic 11) as a symbol of peace. In fact, it is estimated that more than 10 million paper cranes per year are sent to Hiroshima, mostly from children around the world. 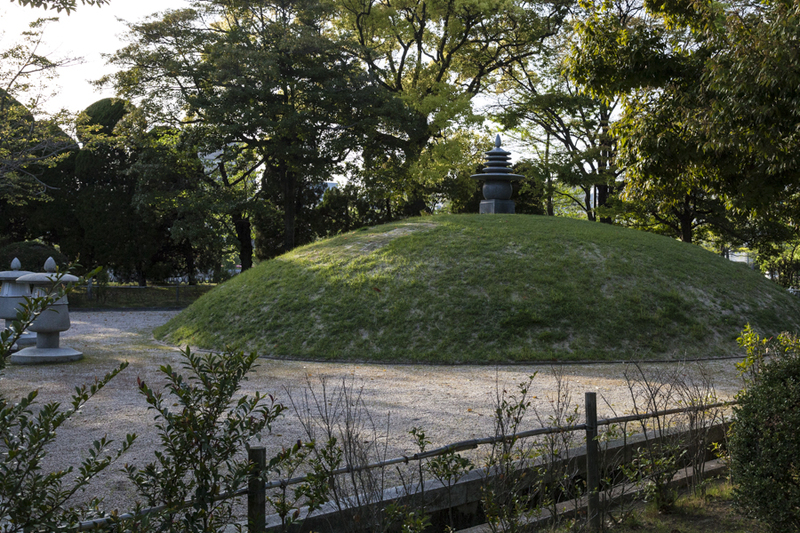 As one would expect, not all victims could be identified and the grassy Memorial Mound (pics 12 and 13) contains the ashes of an estimated 70,000 unidentified victims. 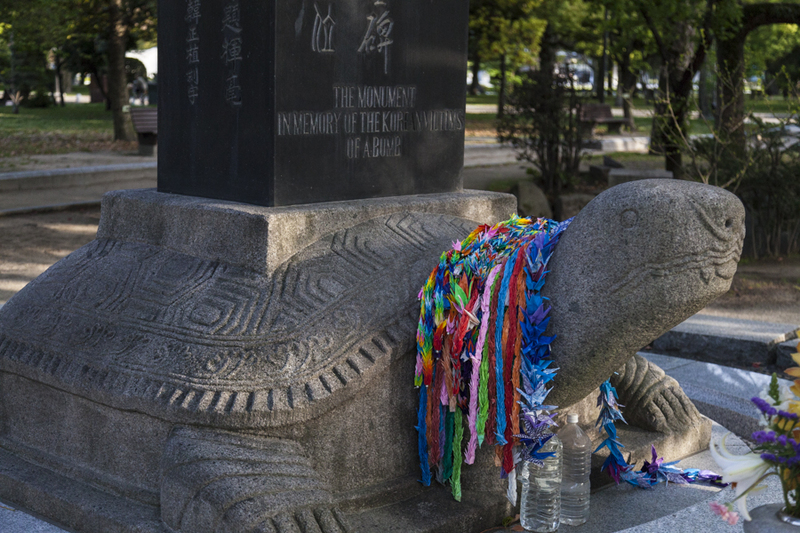 Similarly, the number of Korean nationals who perished is uncertain and the Cenotaph for Korean Victims (pic 14) was created to honour victims and survivors from the bombing and from Japanese colonialism. An inscription on the statue reads “Souls of the dead ride to heaven on the backs of turtles”. Two statues of very contrasting styles encapsulate the message of the Peace Park. 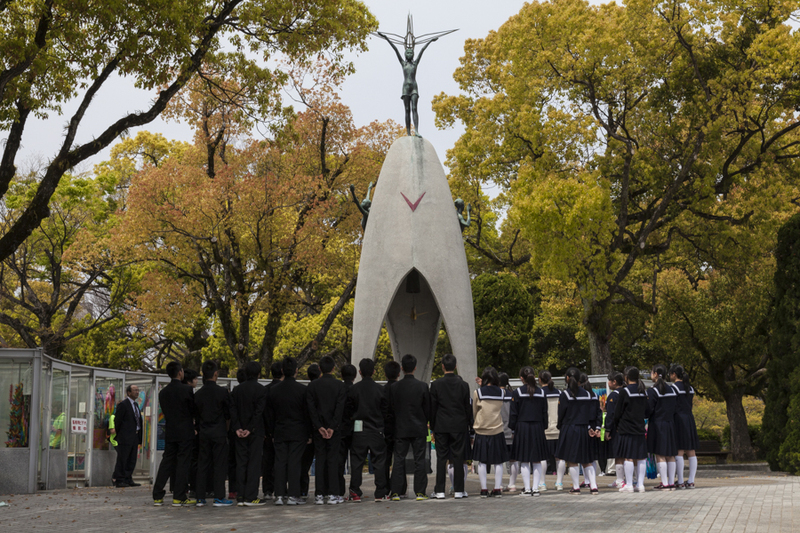 The first is the “A-bomb Victim – the Monument of Hiroshima” (pic 15) located 141 metres south of the hypocentre by the bank of the Motoyasu River. The bronze sculpture remembers those victims who were killed instantly by the blast and serves as a graphic reminder of their horrific end. Although the sentiment behind the sculpture is positive, the twisted, distorted representation of the victim remains confronting. 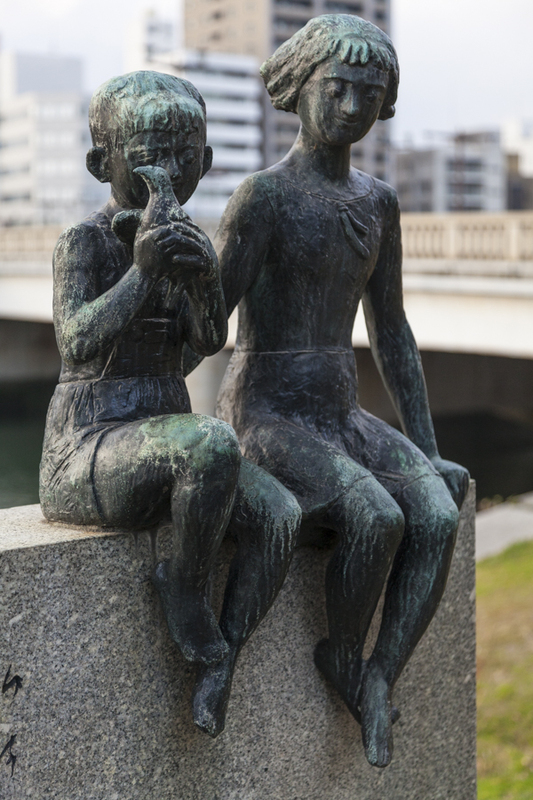 Further along the river, close to the Dome Building, one finds the statue of a girl and boy with the boy holding a dove (pic 16), which communicates hope for a peaceful future. These two contrasting sculptures that show the horror, yet advocate for peace is very much the message of the Peace Park. 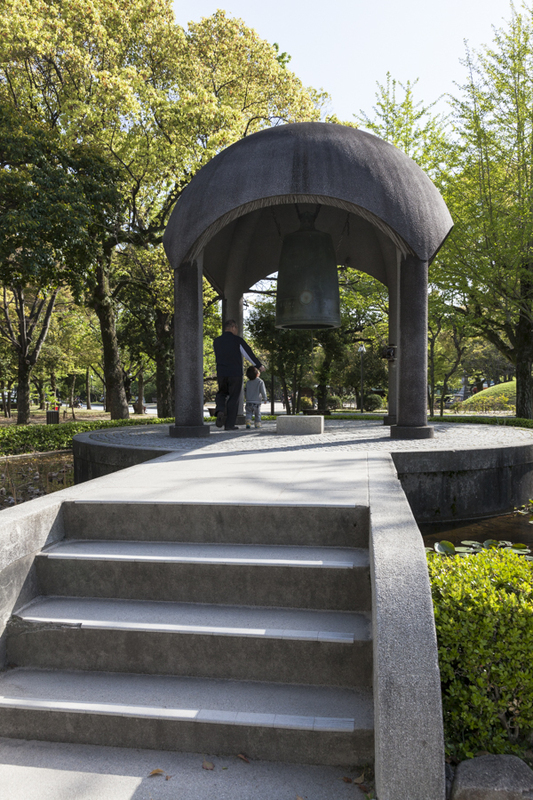 In conclusion, I would like to remember the resonant sound of visitors ringing the Peace Bell (pics 17 and 18) located near the Children’s Peace Monument. This is perhaps the most pleasing sound one hears in the Peace Park. The Bell, donated by the Greek Embassy, is inscribed in Greek, Japanese and Sanskrit characters, which translate to “Know yourself”. 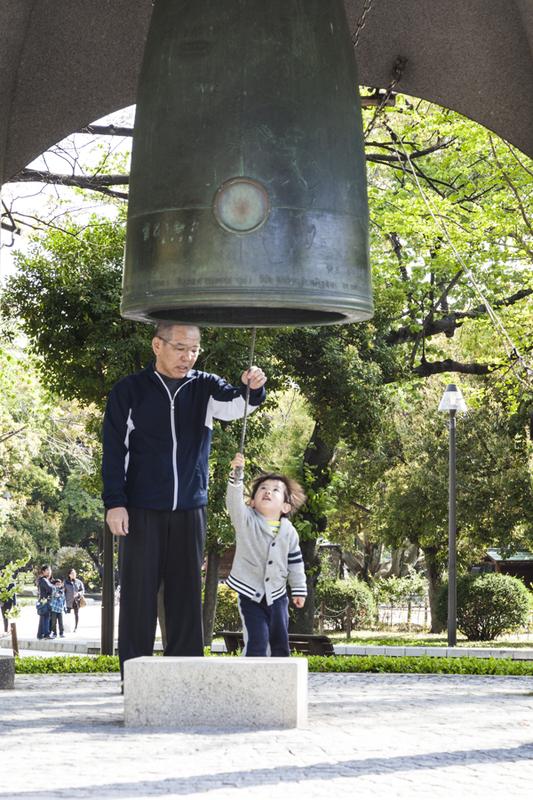 I rang the bell only once during my final visit as a mark of respect and to bid farewell to Hiroshima. Whilst I cannot speak for others, I found the experience of ringing the bell as akin to that of making a commitment to support the message of the Peace Park. Tags: A-bomb Victim Monument*, atomic bomb, Black Border Images, Children's Peace Monument*, Hall of Remembrance*, Hiroshima, Japan, John Liddle, johnliddlephotography, Memorial Cenotaph*, Memorial Mound*, Monument to Korean Victims*, Paper Cranes*, Peace Bell*, Peace Park, people, Sadako Sasaki*, Travel | Permalink. In my last post I described Hiroshima’s Dome Building as the most enduring symbol of the catastrophic events of August 6, 1945 when an atomic bomb was exploded over Hiroshima. 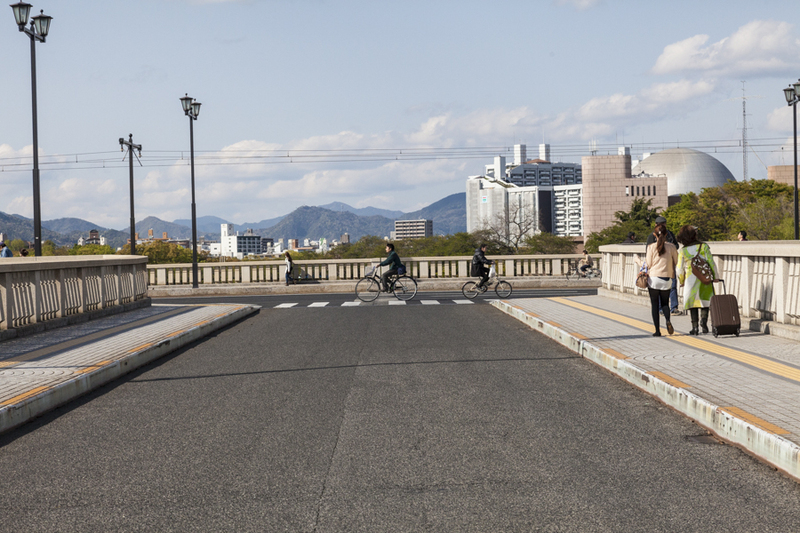 Today, looking across the Motoyasu River from the Dome Building, the wasteland has been regenerated in the form of the magnificent Peace Park, at the end of which and in a direct line of sight to the Dome Building lies the Hiroshima Peace Museum (pic 1). For those readers who would like to see vision of the Peace Museum soon after its opening, I suggest watching a classic French movie titled “Hiroshima Mon Amour”. As the title implies, the movie is set in post-war Hiroshima and the opening scenes contain some interesting footage, including a walk through the Peace Museum and some early footage of the Peace Park during development. A visit to Hiroshima is incomplete without visiting the Peace Museum and my advice would be to allow more time than you may expect. Given the historic event it exists to portray, the Museum is confronting in the way it provides an accurate and objective account of the events of August 6 1945 and thereafter. In fact, the objectivity and lack of rancor in the presentation of the story is commendable and refreshing. The horror and atrocity is, of course, recognised and discussed, but most importantly the emphasis shifts to the need to learn from what happened and ensure that history is not repeated. It is a museum that should not be rushed and can be visited more than once. Today’s photographs are mostly shots of Museum exhibits, including a number of archival photographs on display in the Museum. The pictures tell the story. The model at pic 2 shows the hypocentre of the blast as the red pole just to the right of the Dome Building where, it is estimated, the temperature would have approximated 4000 degrees Celsius. One can also note the intersection of the two bridges to the left of the Dome Building forming the T that was the target point for the Enola Gay’s bombardier. One minute following the explosion, the mushroom cloud photograph (pic 3) was taken by Russell E Gackenbach; a crewman on the Necessary Evil, which accompanied the Enola Gay. It was reported by Russell Gackenbach that the crew’s return journey was made in silence after witnessing the event. Whilst there is no need for further description of the pain and suffering depicted by pics 5 and 6, the obvious tenderness of the Red Cross nurse and the gratitude of her patient at pic 7 is a heartwarming image of the human spirit. The series of shots (pics 10 to 16) titled Memories of the day give an insight into the minds of survivors and are particularly compelling when one considers the drawings and paintings were made decades later. One hopes the process of graphically sharing their recollections provided some level of comfort to the contributors, yet their clarity of memory is a frightening reminder of the lasting effects of traumatic events. On a more positive note, pic 17 shows a 1956 photograph of Japanese students seeking support for the establishment of a Children’s Peace Monument. Their efforts were successful and photographs of the monument will be shown in my next post. 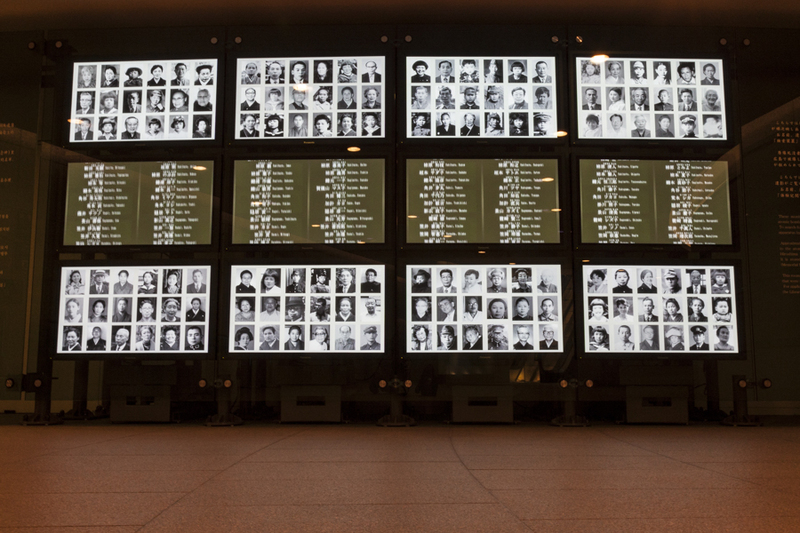 An ongoing role of the Peace Museum is to monitor nuclear testing internationally and via the Peace Watch Tower (pic 18) located in the Museum foyer, to display the number of days since the atomic bombing of Hiroshima and the number of days since the last nuclear test. At the time of posting this blog (August 15, 2014), the current figures are 24,923 days and 49 days respectively. I strongly recommend anyone visiting Hiroshima to spend time visiting the Peace Museum and the other memorials within the Peace Park. Although the history is dark and sombre, its purpose is to advocate for an end to nuclear arms and a brighter, less oppressive future for all. I have never before written a comment in a Visitors Book. However, during my first visit, I commented to the effect that all newly elected politicians should spend a few days there before taking office, in the hope that they may better understand the futility of war. Perhaps the hope is futile, but who knows! Tags: archival photos*, atomic bomb, Black Border Images, Buildings, destruction, Dome Building, Enola Gay, Hiroshima, historic sites, Japan, John Liddle, johnliddlephotography, nuclear, Peace Museum, Peace Watch Tower*, ruins, survivors' drawings*, World War 2, WW2 | Permalink.